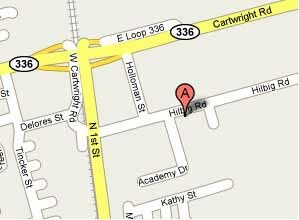 We are strategically located next to the Montgomery County Criminal Justice Center. If arriving from the north, take N Loop 336 East to the Criminal Justice Center exit. If coming from the south, take N Loop 336 East to the Criminal Justice Center exit. Parking is available in our public lot. We service the emergency needs of our callers 24 hours a day, seven days a week.